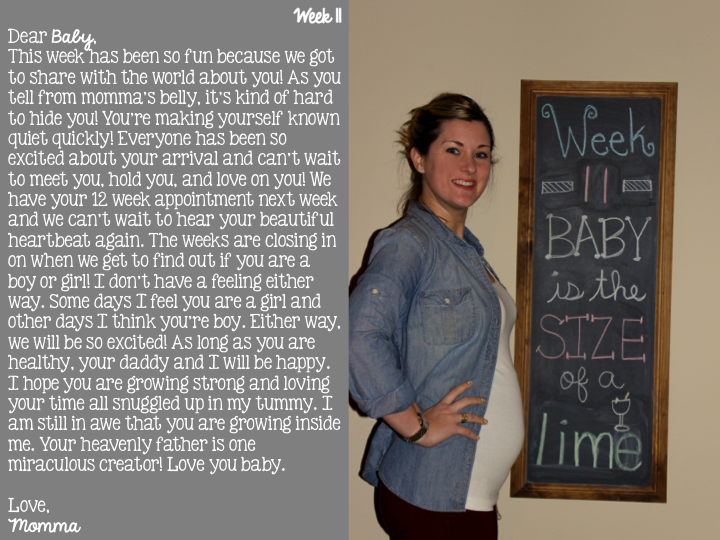 week 11- bump update and letters for baby - The Mrs. & Co.
Total weight gain: I would say probably 2 pounds. We will find out at my 12 week appointment next week. Maternity clothes? Maternity pants all the way but I can still wear my regular shirts. Miss anything? wine and sushi. I want a rainforest roll from Blue Fish right now SO bad! Food cravings: I am craving sweet pickles and have a jar in the fridge at all times! Symptoms: headaches, cramping, constantly peeing, nausea, can smell everything, acne, large chest. It's all beginning! Looking forward to: our 12 week appointment and hearing the heartbeat again!